A highly advanced design for this fin that is moulded from two materials with very different characteristics: a strong polypropylene for the blade and soft elastomers (thermo rubber) for the foot and protective inserts. The result is an extremely light and well-balanced fin, of average size, with surprising reaction time and a formidable thrust. The side stringers that extend all along the blade and two flaps situated along the end of the blade itself make the fin very directional. The blade originates from the upper part of the foot pocket, with a 20% increase in useful surface area compared to a traditional fin of the same length. The foot pocket is computer designed and guarantees ideal transmission of the leg-fin thrust. The lightness and perfect balance of the materials, together with the extremely modern design, make Rondine Pro Light a generous fin that provides exuberant performance without too much physical effort. 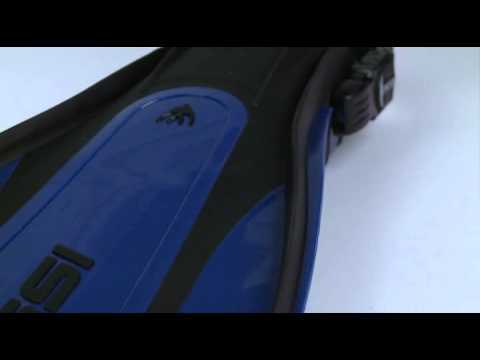 These fins are perfect both for beginners and for professionals and are very common amongst instructors and technical divers.